Payroll training is very important for the success of a business, no matter the size. It is nearly impossible to have an "audit-proofed" business - but you can certainly be ready with an audit-secure your business! You will be encouraged and exhilarated when you get all the information you need in the 55 minute instructional webinar. Plus, it goes even further with self-audit checklists, wage and hour laws by state, IRS forms and publications. 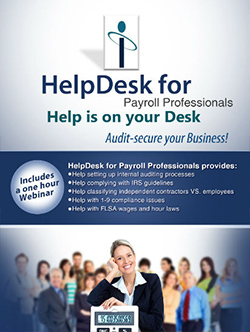 Get the time-saving help needed to be compliant with the I-9, FLSA, Employee/Contractor Classification and much more!